SO WHAT HAPPENS AFTER YOU GRADUATE YOU ASK? DRAKE MEDOX COLLEGE GRADUATES GET JOBS! When you go through a Drake Medox College program, you will take part in an in-depth “Job Seeking Skills” training module, which provides students with an opportunity to practice interviewing skills through role play and mock interviews. Each student prepares a completed résumé, learns key job-finding techniques, and receives a documentation checklist which is needed to facilitate their job application process. This experience will be very valuable in helping you to prepare to secure a good job. Drake Medox has been in the business of employing and training healthcare workers for over 40 years, and during that time we have established many very strong relationships with individuals and organizations within the healthcare services community. As a result, we are able to connect our graduates with regular job postings as soon as they are ready to begin their job search. Drake Medox College’s program is so highly respected by healthcare service providers, that you will be well positioned to land the job you want! You will be able to find openings in home support agencies, intermediate and extended care facilities, special care units for persons with dementia, adult day centers, and private homes. Healthcare employers are calling us and seeking our grads, click here to see the job postings. 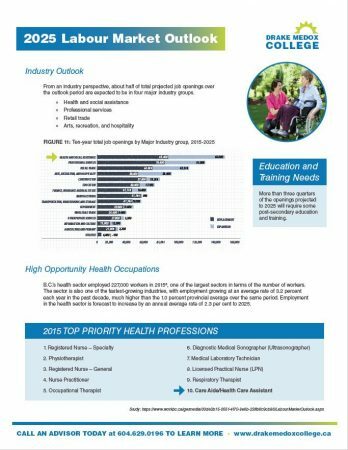 Health Care Assistants/Resident Care/Community Health is currently the fastest growth market in BC, primarily because of our aging population. According to the Working in Canada Report employment prospects for this field are very good, and job demand will be in excess of job seekers from 2009 – 2018. Since completing the Health Care Assistant training course at Drake Medox College, I have gained the necessary knowledge, training, skills and confidence to work effectively with the elderly, children and people with developmental disabilities. I believe this course has helped pave the way for greater job opportunities and I since successfully been hired both as a live-in Manager and as a Life Skill Worker. Thank you so much Drake Medox College.